Lincoln City, located on the Central Oregon Coast at the 45th parallel, is ideally situated for the maximum in vacation enjoyment. The Pacific Ocean with 7 ½ miles of sandy beach to the west, the Salmon River to the north, Devils Lake and the Oregon Coast Range to the east, and the Siletz Bay and River to the south. Not only does Lincoln City offer plenty of outdoor recreation, but it also offers a multitude of other vacation opportunities. Billing itself as “A Great Place to Try New Things,” in the 2011 addition of its Visitors Guide, Lincoln City follows through with an intriguing list of some of the possibilities available. For instance you can learn to blow glass, make and fly a kite, or learn windsurfing, paddle boarding, or kite boarding. The Culinary Center in Lincoln City not only trains future chefs; but you can take a variety of short classes offered Thursdays, Fridays, and or Saturdays. Of course, Lincoln City has all the usual beach activities. 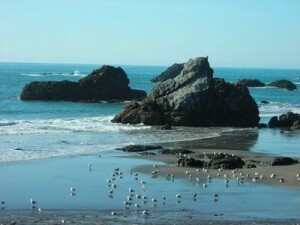 From walking on the beach and sun bathing to boating, fishing, surfing, crabbing, and clamming, you can do it all here. You can also go fishing and canoeing at Devils Lake. There are a wide variety of hiking possibilities, both on the beach and in the Coast Range. During the winter, when storms stir up the sand, you can hunt for agates and fossils. The North Lincoln County Historical Museum contains some rather unique items. In 1949, a Japanese horned mine was ashore. It was disarmed by tunneling underneath it and removing its workings. The museum also displays baskets made by the Native Americans who lived here before the first settlers arrived, a collection of Japanese fishing floats, and artifacts from the dairy, fishing, and cannery industries from the homesteading era. One of the sites to see in Lincoln City is a bronze statue of a young Abraham Lincoln on horseback, studying. The statue was produced by Anna Hyatt Huntington and donated to the city in 1965. The statue had been rejected by both the State of Oregon and the University of Oregon, due to the cost of shipping, which was $25,000. Today the statue stands in front of the Lincoln City Community Center. It is listed as one of the items on the Smithsonian List of Outdoor Treasures. The Lincoln City Visitors guide helpfully lists possible activities by age group: children, young adults, adults, and seniors. Pet owners will be delighted to learn that Lincoln City is a pet friendly city. Dogs on leashes are welcome on the beaches, in some of the shops, and in an astounding number of motels. Each year in May Lincoln City holds the Mutt Masters Dog Show and Olympics. For $3 you can enter a dog in one category. For $25, you can enter a dog in unlimited categories. There is even more fun with someone doing pet psychic readings. It’s a great time for dogs and people. Vacationing in Lincoln City presents an enormous number of possibilities. Surrounded by such a variety of natural resources, you can spend most of your vacation outside. It is a delightful place to try something new.